REBEKAH aka. TY [Stolen by Lucy Christopher] - "I should stay because you need me. You don't want to face it but you know in your heart that the only reason you're still alive is because of me. I've lived in the wilderness and learned to survive. I'm smart. I know all of the skills required to keep this balloon in the air. You won't make me jump over the side. I won't let you. You're going to survive and I'll make sure you do. We belong together, six of us, no matter what you say. So if you're going to live then so am I because you need me. want to live." RUBY aka. THE DARKLING [Shadow & Bone by Leigh Bardugo] - "I know I deserve a place because, let's face it, who wouldn't want to be in a hot air balloon with me and my seductive charms? *winks* *tosses hair* *admires myself* I have the charisma to keep the journey interesting and my undying love for Alina only goes to demonstrate my stamina. If anyone tries to harm my fellow survivors, I will perform the Cut and use every aspect of my power of darkness to ensure everyone else's survival as well as my own. I have Keftas to provide us with warmth and my force to allow us to travel under the cover of darkness. Also, have I mentioned I'm gorgeous? Because I am. I'm drop dead gorgeous. Like, nobody-cares-what-the-heck-I-do-because-I'm-gorgeous kind of gorgeous. I'm not a man of many words so I won't be frustrating to be with and I promise my charms will keep all entertained throughout the journey. *Swooshes cape, bows out* *comes back* Just remember, I'm gorgeous to look at." JACK aka. CRUZ [Shipwrecked by Siobhan Curham] - "Would you ever throw the last bottle of water we have off this hot air balloon? Would you ever send your food, your map, your clothes, all essential to your survival, into the forest below? I thought you mightn't. Choosing me to leave this basket, to parachute into the greenery of the jungle, would be to simply throw away the most vital ingredient of your survival. You need me. This group needs someone who can not only lead, but someone who is able to keep everything under control, reinforce the background of our journey. And all of you know that I am the one trustworthy enough to who you depend on. I survived countless days stranded on a mysteriously haunted island, holding my group of friends together like the glue holding the sand to the sea. I have the courage, the strength, the experience. What reason would you have not to keep me here? I am crucial to this team." AMBER aka. LUNA 'LOONY' LOVEGOOD [The Harry Potter Series by J.K Rowling] - ""Lots of people think my head is constantly in the clouds, but it's not. I'm actually very clever, focused, and observant, and I am the ultimate quirky travel companion. I studied at Hogwarts and now I'm one of the best witches out there. You need water? With a flick of my wand, you'll have as much as you need. You're hungry? Here, let me make you a delicious meal. My wand is the key to your survival. Without it, how do you expect to survive? I have everything you need. I am everything you need. 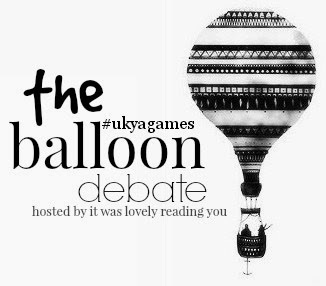 It's clear who belongs in the UKYA games."" CHARLI aka. TOBY [The Geek Girl Series by Holly Smale] - "Hi! Well. I know I haven't won the Hunger Games, I haven't saved the world, anything like that, but I feel like I should live because I'm just a really nice friend. I'm kind, and I help people wherever I can, and I just think that makes me a really good person. I think I help boost peoples' confidence, like Harriet, and I'm trying really hard in school. I might not be top of the class, but I'm average, and ultimately, I'm still learning. And I think that shouldn't be taken away from me, because I still have so much more to give to this world, and my future is bright :) Thanks guys :)"
SOPHIE aka. SILVER [The Elites by Natasha Ngan] - "I'm Silver, an Elite, from Neo-Babel. There may be a rumour that we as Elites don't bleed, but I don't want to find out whether that is true or false, by being thrown out of a hot-air balloon! So far, I've had a tough-ride. I've been accused of killing the president, and when I finally thought I had a chance of fitting-in! I felt like I belonged - and that I was finally beginning to fit in even though I'm possibly the worst Elite they've ever had. Allowing me to guard the city? It probably wasn't their best idea, but I tried. I really did. This basically wraps up my argument. I shouldn't be thrown over the edge of this hot air balloon because at the moment I'm trying to escape, and there's a lot going on in my life. Oh, and I'm currently fleeing the city with my best friend, who flies by the way, so I'm too busy to hurt myself." who will stay and who will jump? come back for part ii. at one thirty. Jack and Amber's and incredible.